In just a few days, 2016 will be history. What a year this was! At Paradigm Initiative, we had a busy and productive year. We added a new office in Kano, reviewed our strategy to reach more youth, upgraded training curriculum to align with new market demands, welcomed additional team members, signed agreements with new partners and added value to the lives of more under-served youth! After running the #DigitalJobs campaign for 2 years, Paradigm Initiative folded the campaign into our LIFE program to enrich the student experience and focus our impact on students who are able to get the full 8-week (now 10 weeks) LIFE experience. It’s no surprise that 1 in every 2 LIFE program graduates either got internships, jobs or built businesses around skills learnt this year. Of course, many got a chance to earn enough in order to continue with the tertiary education they always wanted! It only gets better as we roll out the new curriculum in 2017. The TENT program (which gets a new name, Techtiary, in 2017) grew from just one school to four, with active student-led groups that spent the year adding skills that will help them graduate with more than just CVs! The least they’ll graduate with are market-ready skills in high demand, and who knows, some of them could hire their colleagues to start out even before convocation day. Some of our students who started the program 5 years ago, now in their final year, are using the projects they started in Year 1 as their Final Year Project. We deepen the impact in 2017, as student-led groups come to additional schools across Nigeria. 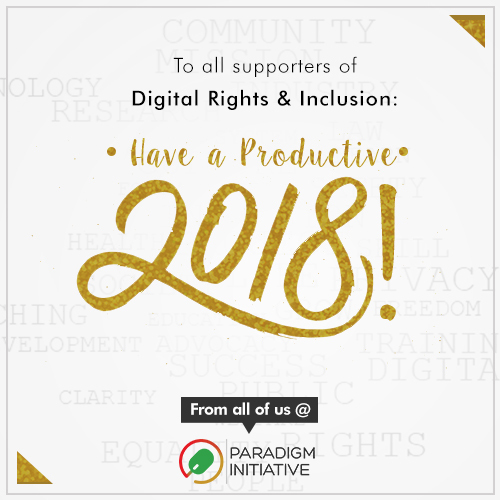 2016 was very busy for the ICT Policy program — which will be known as Magoyi (Hausa word for advocate) from next year — at Paradigm Initiative no thanks to various government policies and actions that threatened citizen’s online rights. We published reports, shared educative information, hosted solution-focused meetings, lobbied at the National Assembly, discussed “complex” issues with relevant agencies and went to court when amber turned red on some of the issues. Considering the similar nature of threats to Digital Rights across Africa during the year — and with the new trend of Internet/application shutdowns and repressive laws/policies — we launched our first Digital Rights in Africa report at the recently concluded Internet Governance Forum. And for the Digital Rights and Freedom Bill, 2016 was a good year. The Bill was introduced on the floor of the House, got first and second reading, and we teamed up with the Committee on Human Rights to make sure the December 5 Public Hearing was public – streamed live and with input from diverse stakeholders. This year, we welcomed Intel (through the #SheWillConnect program), Facebook, AccessNow, CDI Global (a global network of Digital Inclusion organisations that will help deepen our work in Nigeria and expand into Africa), Global Network Initiative (through an Internews Fellowship) and Ford Foundation (with multi-year support to expand our Digital Rights work beyond Nigeria) as Paradigm Initiative partners, to strengthen our existing stakeholder ecosystem. Hajia Jummai Umar-Ajijola, PhD, a seasoned expert with experience across business and civil society, also agreed to join the Paradigm Initiative Advisory Board! I’m sure you saw what I did throughout this message, with Nigeria missing from our name. It’s not a typo, and we’re not leaving Nigeria 🙂 From January 3, 2017, Paradigm Initiative’s focus as a social enterprise will be pan-African. 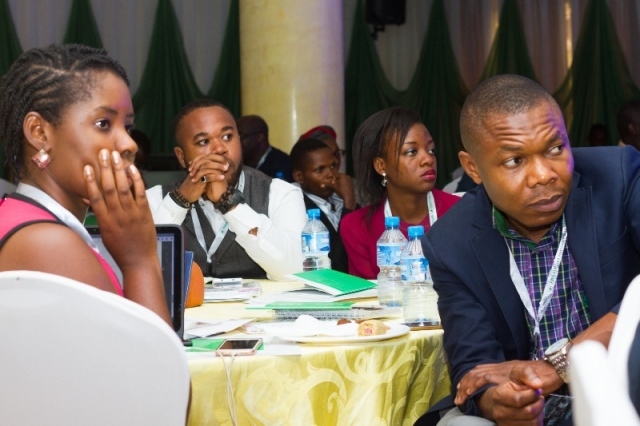 Our Digital Rights work is taking us into new regions on the continent, and we’ll tell you more about that at the Internet Freedom Forum holding April 25-27 in Lagos. If you are yet to register, please head to www.pinigeria.org/iff and register immediately. You’ve also probably noticed that our social media handles changed to @ParadigmHQ. It’s all part of the process that has now started and will culminate in a reintroduction of your favourite Digital Rights and Digital Inclusion social enterprise in April 2017. As we did just before 2016, and do each year, the team met last week to plan each day of 2017 and we’re now in holiday mode. As we prepare to hit the ground running on January 3, 2017, I want to say a huge thank you for everything you did to help us inch closer to every plan we had for 2016. We have more than 2,016 reasons to be grateful. Thank you for your continued support, and we sure look forward to an exciting 2017! I wish you, your family and loved ones a happy holiday and an amazing 2017 ahead. A sha hutu lafiya! Ézūmíké óbī ụ́tọ́. E kú odún! PIN will be launching our first ever Africa-wide report on Digital Rights at the upcoming Internet Governance Forum (IGF) on the 8th of December, 2016 in Guadalajara Mexico. The report has become necessary to be able to offer keener perspectives through research on the state of access to digital rights in Africa and be able to offer a one-stop shop material for everything status of digital access and rights in Africa. We are excited to inform you that Yaba College of Technology (YABATECH) and Lagos State College of Health Technology (LASCOHET) has joined Nnamdi Azikwe University (UNIZIK), Obafemi Awolowo University (OAU) and Federal University of Technology (FUTA) to commenceTENT@School clubs in their institutions. As PIN’s TENT@School clubs spread across institutions in Nigeria, we will be delighted to read from you in making request to start TENT@School club in your institution as we equip students with ICT skills while they are enrolled at their Universities. LIFE Quarterly workshop for Q4 2016 held on Saturday November, 26 2016 at the AjegunleLIFE and DakataLIFE Centres. The workshops were facilitated by Damilola Adelusi (AjegunleLIFE) and Abdulbaseet Kabir (DakataLIFE) respectively. As part of the PIN’s ‘She Will Connect’ partnership with Intel, 125 secondary school girls were trained at the Digital Readiness Workshop for Girls. The Digital Readiness Workshop for girls held in Lagos Tuesday 22nd and Wednesday 23rd November, and in Abia and Kano centres on Tuesday 29th and Wednesday 30th November. The girls were trained on Microsoft Office Tools, Online Research, Social Media and Digital Security. DakataLIFE team received an invitation from Arewa radio to do a short interview about the training on a weekend program; ‘Ya Take Matasa.’. Two graduates of the AjegunleLIFE training were employed in the month of November; Chidimma Onyekaba (2016C) got employment as a computer studies teacher at Queen Esther International School while Lesley Tarabina (2015C) was offered a year’s Internship placement at W-TEC. AbaLIFE Town Hall meeting held on the 25th of November 2016. The meeting had 110 people in attendance and a number of 21 beneficiaries were issued certificates upon completing all requirements of the program. Exciting! Our Dare to be the Brightest ICT Guy/Girl project hosted 30 schools in Kano State from October 20th -22nd, 2015. The training and ICT Quiz competition was organised in conjunction with the state’s Ministry of Education, with adequate support provided by Etisalat and Dufil Foods (the makers of Indomie). 476 students participated in the two-day training and 29 schools were represented at the ICT Quiz Competition. The winners of the 4th edition of the Dare to be BIG competition were Government Secondary School Kawaji, Government Girls Secondary School Shekara and Government Girls Secondary School Dukawiya who took 1st, 2nd and 3rd position respectively. The schools were presented with trophies while the students who represented the schools and were also presented with Etisalat Cliqlite courtesy Etisalat and android phones. Participants that took 4th-8th positions were also given branded shirts, and all schools were given educational comic materials as consolation prizes from Etisalat. PIN will be hosting its annual TENT Gathering event from November 24th – 26th at the Nnamdi Azikwe University, Awka. The 3-day programme will feature Opening and Closing Keynote speeches, Tech Entrepreneurs, Panel speakers, full day practical sessions on various programming languages. 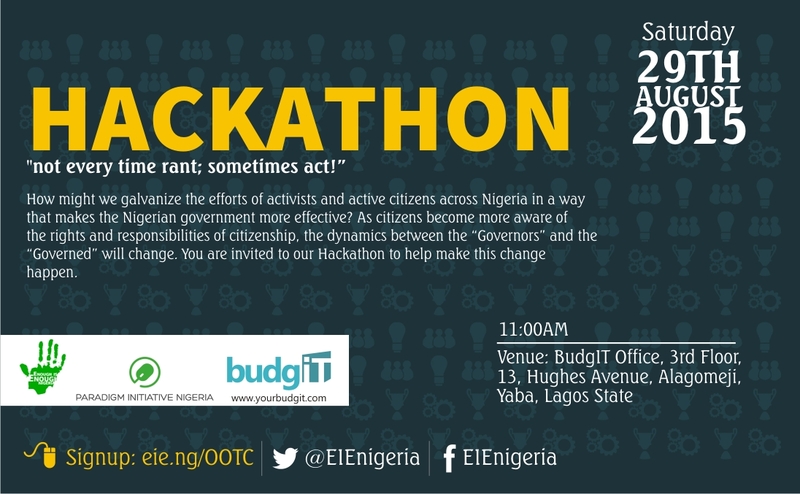 Intending participants are encouraged to register via bit.ly/tentg2015. The PIN ICT Policy Office made a FoI Request to the Nigerian Communications Commission (NCC) based on reports that the Commission shares call data of private citizens to security operatives. The content of the request was that the Commission provide the public with details of the due process followed by them in handing over such data to security operatives. The commission confirmed receipt of the request. PIN also sent a letter to the Central Bank of Nigeria to suspend the Bank Verification Exercise (BVN) it mandated all Nigerian banks to embark on. The letter was written against the background of President Buhari’s call for harmonization of all data collection agencies in Nigeria pending the time a viable law is passed by the National Assembly to cater for Data Use in Nigeria. The letter was acknowledged by the Apex Bank as received. PIN Executive Director, ‘Gbenga Sesan and Chief Operating Officer, Tope Ogundipe attended the Stockholm Internet Forum(SIF2015) that held in Sweden from 20th -22nd October 2015. PIN also released a country report on Women’s Rights Online in Nigeria, this report was launched along with a global reporting online involving 9 other countries during the Stockholm Internet Forum. In the month of October, Ajegunle and Aba Innovation Centres continued to touch the lives of under-served youths through the L.I.F.E. Program. The final session of training for the year 2015 commenced with rigorous selection process from a pool of several applicants for the 2015D session. 40 qualified applicants were selected to partake in AjegunleLIFE 2015D session while 65 applicants were selected for AbaLIFE 2015D session. Orientation exercises for selected students, parents and volunteers also held concurrently at both Ajegunle and Aba Innovation Centres from Tuesday 6th – Friday 9th October 2015. The orientation sessions are for the purpose of getting parents and students acquainted with the L.I.F.E. training program. L.I.F.E. 2015D training commenced with the ICT classes 12th October 2015, the students were trained on how to use different Microsoft productivity tools (MS Word, Excel and Powerpoint) and the Internet. 5 students from AjegunleLIFE alumni were selected to volunteer for W.TEC (an initiative that runs an after-school Technology Club in public schools). PIN celebrated the first anniversary of her Digital Jobs project in Nigeria on October 2nd, 2015. The 1st anniversary tagged #OCTOBER2, was well attended by stakeholders who have worked with Paradigm Initiative Nigeria on the Digital Jobs project. Ugochukwu Nwosu, Stakeholder Development Officer for Rockefeller Foundation in Nigeria and Ghana was in attendance to give the opening keynote address at the event. In addition, online workers who have been trained by PIN on the Digital Jobs project were present to share their success stories. Trainings in the month of October included the specialised skill class featuring the Advance Microsoft Office Suite with Joel Ogunsola and David Olaniyan as facilitators. The 22 Participants who attended the training on the 7th and 8th of October learnt how to use Microsoft Office Word, Excel, PowerPoint and Project to enhance their productivity. In addition, the Marketing and Sales training class facilitated by Jide Adeyemi took place from 13th to 14th, October 2015 and was attended by 21 participants. Participants learnt how to effectively sell their products or services. PIN also organised 2 online work trainings in the month of October. The first training was attended by online workers who are having challenges with their Upwork/Elance accounts while second training was a special session for undergraduates from Yaba College of Technology, willing to earn an income whilst schooling. The trainings took place on the 9th and 30th of October and were facilitated by Gbenga Adebiyi and Elijah Otor respectively. Prizes were also presented to the winners of the Digital Jobs #SeptemberChallenge. The contest which took place from September 7th – October 28th required online workers from October 2014 to post a 15-second video of them pitching their work on Instagram. Winners of the challenge were Elijah Otor, Tobi Obaniyi and Gbenga Olukosi who won Mini-laptop, Tecno Camon C8 and a Universal internet respectively.